Custom made roman blinds are versatile and suit a variety of tastes and decors. They have a similar aesthetic to a roller blind when down, but offer a more modern and contemporary look and feel. Instead of rolling up, they fold up evenly into cleats to give the blind depth. They can be matched with our Panel Glides and Roller Blinds to give an elegant harmonised look throughout the whole house. 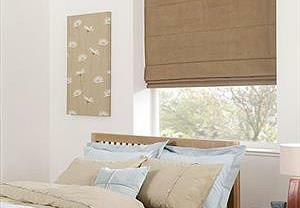 We manufacture all our own roman blinds in our factory in the northern suburbs of Adelaide. We use a combination of modern and traditional methods to ensure our Roman Blinds are of the best quality. Our roman blinds are available in a range of Translucent (light filtering or sunscreen) or Blockout fabric types so will offer the benefits of style, privacy and controlled light. They are a low maintenance blind solution with a cord/pulley operation which enables you to control how much light is exposed and at what height the blind sits. Our showroom is an easy drive to 1387 Main North road Para Hills West, (right next to Ultimate Waterbeds!) so if you're driving past, please stop in to see the wide range of window blinds and awnings styles we have available. We also offer free on site measure and quotes, so alternatively, please call us, so we can show you the range of fabrics and colours in the comfort of your home or office. You'll then see how roman blinds can transform the style of your home. We cover all of Adelaide metropolitan and some regional areas upon request. Simply fill-in the form below to request a free no obligation quote.